I love the flavor of this punch recipe - and I don't even like bananas! The straining step is necessary, but kind of a pain. It will take time to force the mixture through the strainer. But if you skip this step, there will be clumps of banana in the finished punch, which are not pleasant. Put this punch in a large punch bowl and surround it with little cups for a wonderful cold beverage for a party. You can float an ice ring in the bowl if you'd like. 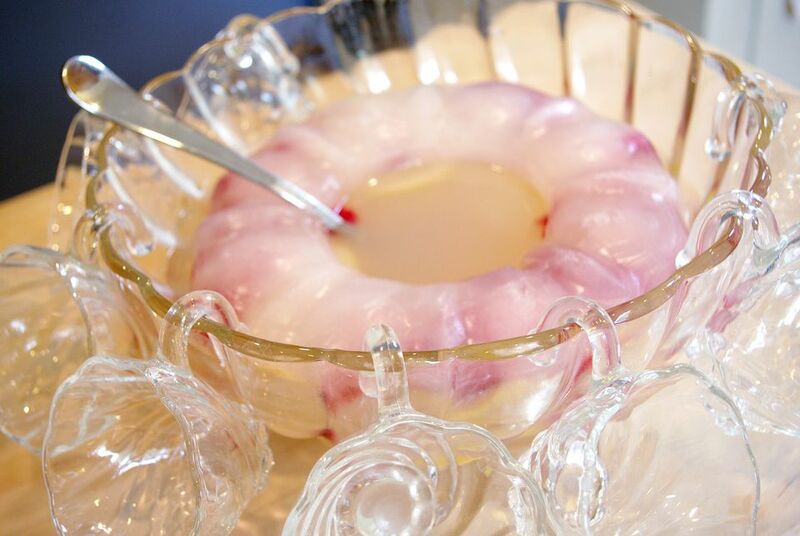 Put some maraschino cherries, banana slices, and pineapple chunks in the ice ring to make it pretty. 1. In a large saucepan, heat the water and sugar to a rolling boil. Remove from heat and cool completely. 2. In a large bowl, mash the bananas and blend with about a cup of the pineapple juice. Strain this mixture through a mesh strainer and discard the solids remaining in the strainer. 3. Then add the cooled sugar syrup and remaining juices (NOT ginger ale or 7Up) to the banana mixture and stir well with a wire whisk. 4. Freeze in a 5-quart freezer container, stirring once during the freezing process. Then label the container with the name of the recipe, the date it was made, and instructions for using it. 5. To serve, let the frozen punch mixture stand at room temperature for about 1-2 hours until it is softened. 6. Transfer the mixture to a large punch bowl, and add ginger ale. Stir gently to combine, but don't stir too much or you'll lose some of the carbonation. You can also make individual servings of this by scooping the frozen mixture into glasses, filling 1/2 full, then filling the remainder of the way with ginger ale or 7-Up.